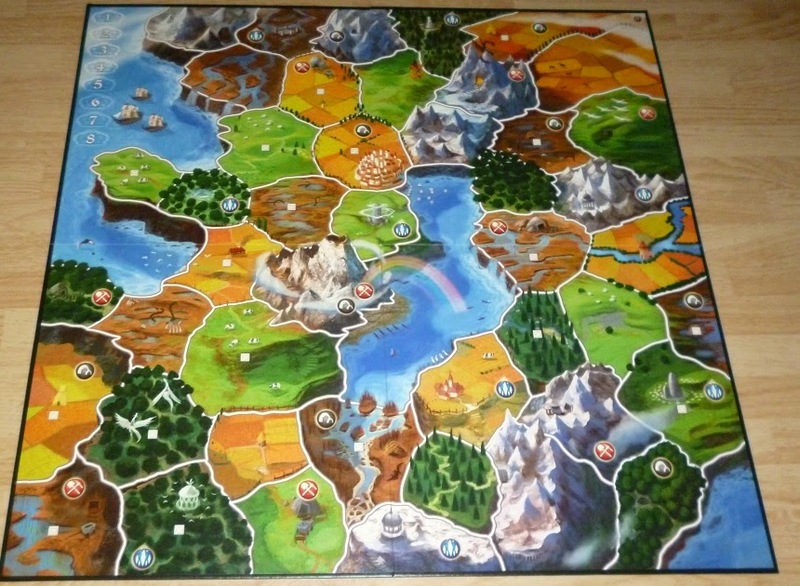 We're going to take a look at Small World, a strategy game from Days of Wonder. A little background: Small World is a retheming of an older game, Vinci. Vinci was a similar game about the rise and fall of empires, although it was wrapped up in a rather bland, themeless package. (It was very much a Eurogame during a time in which Eurogames were the dominant genre.) While gameplay is very similar, there are some fundamental differences. 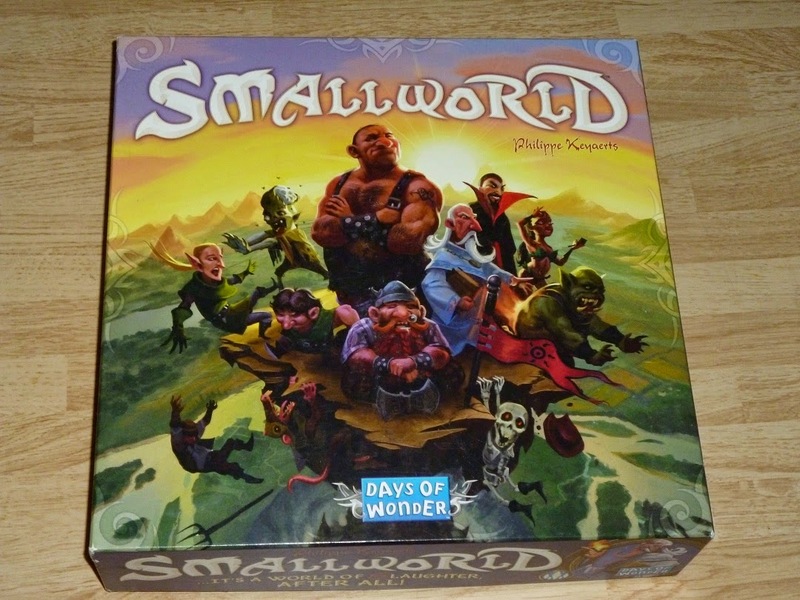 Small World is a cleaner, brighter, more accessible version of the game. In addition, the game has been very popular, and there are many versions of it out there--a lot of expansions, online implementations, and even a sequel! This review is only covering the first, basic game. The object of Small World is that the world is, well, small--there's only so much space for the mythical creatures of the world to live in. As such, there's immediate conflict between different races as to who controls territories across the world. 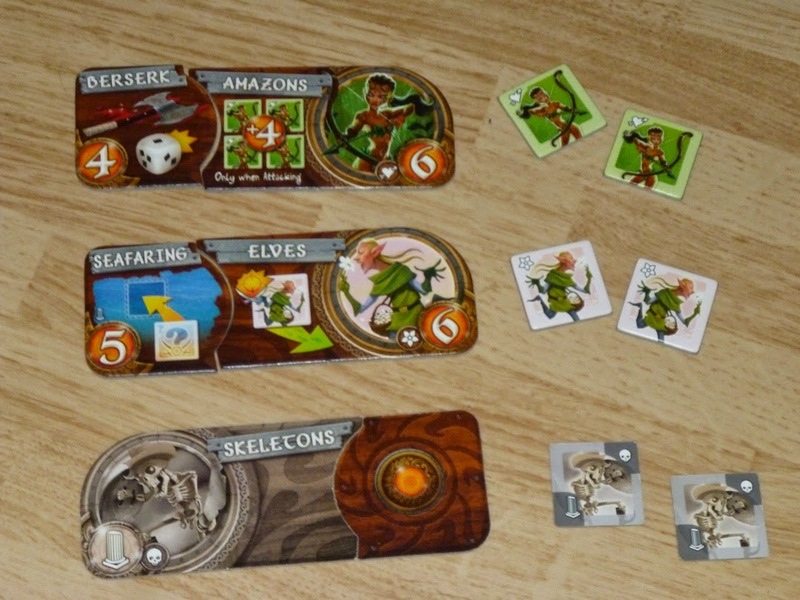 And plenty of mythical races are covered, from skeletons and giants to sorcerers and elves. How those races are represented on the board is one of the game's better innovations. There are not only 14 races in the game, but 20 special abilities. Each race is randomly matched up with one of the special abilities, and then players have the option of choosing those pairings. We'll look at that in more detail here in a moment. Each turn, a player has a certain number of tokens for their selected race. They expand on the map by moving tokens to new areas. The very last turn might net some bonus damage on a modified die, but aside from that there's no luck involved in the combat. After a player has expanded as much as they want--they may want to keep some in reserve for defense--they can redeploy their forces to firm up their borders. Losing a battle will cause some (but not all) of your units to get discarded, so eventually your forces will be depleted. At the end of your turn, you earn victory tokens equal to the number of territories you control. Seems straightforward enough? At some point, you're going to run out of forces (every time you get attacked, some of your units are permanently defeated) and at that point you can declare that your race is going into decline. You can't make any moves on that turn, and you flip all of your current holdings on their back side to note that they are in decline. At this point, you get to choose a new race/ability combination. There are always multiple races available to choose from, but they're in a certain order. If you want to choose the first one, you can; however, if there's a more advantageous combination further down the line, you can choose that instead...but then you have to "spend" one of your victory points and place it on each one you passed over. You then take the race/ability combination and create a new one. Units in the declining race remain on the board, but they are no longer "active." They still net points to their owner, but their owner can't really do anything with them. What does this mean? It means an unattractive combination gradually gets more attractive as players pile victory tokens on top of it when they pass it over. When you pick a combination, you get all those victory tokens to add to your hand. It's a very nifty balancing mechanism that makes decision-making a lot harder. And example of some race/ability combinations. Note that the bottom one is in decline, so the items are grayed out and flipped over. So that simplified combat procedure I listed above? With the different races and the different special abilities, the game is blown wide open. The Humans, for example, get a bonus victory token for each farmland province they control, and a Flying race can attack any province, not just adjacent ones. Maybe the aquatic Tritons get picked, who can conquer coastal areas with one less token, along with being Fortified, placing special Fort tokens on the board to make it easier to defend. Since there are so many combinations, each game plays a lot differently then the last. The game ends once all the turns are up. The player with the most victory points is the winner. The rules are very simple. There's only so many different things that players can do on their turn, so they generally aren't overwhelmed. Counting out territories and planning ahead sometimes takes a little time, but it's a pretty good balance. The number of combinations for the game is amazing. And the balancing features mean that even crummy combinations will see the light of day, and that sometimes leads to unexpected results. The production values are good. It's a nice, colorful map, nice, thick tokens, and the rules are laid out plainly. Days Of Wonder tend to be good at this sort of thing. The theme is easily accessible. Even if you're not into fantasy, these are cartoon versions of fantasy races. Everyone knows what giants and wizards and dwarves are. The game plays in about an hour, maybe longer for a large number of players, and that's just about right. Too much longer and things kind of bog down, but it shouldn't be much shorter. Some of the races and abilities are a little more complicated than they need to be. The Sorcerers, in particular, seem like a lot of work for not much benefit. The theme is awesome, but it's clear that the "decline" mechanism was meant for the original Vinci. I guess it's not that bad, but for someone who played both versions it seems out of place. This is one of my favorite gateway games--it's a theme people can relate to, the rules are simple yet solid, and it's just a right balance of time, effort, and presentation. I've never played a bad game of this, so I gladly rank it an A.